After obtaining the right permits in Las Vegas, we can begin digging the hole and then installing the fiberglass shell. Putting in fiberglass pools and spas is quick and easy and you can enjoy swimming sooner rather than later. 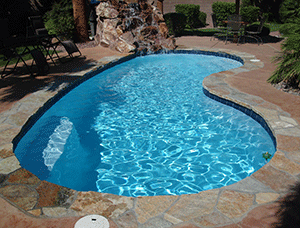 There are many reasons why people go with the fiberglass option for their pools in Las Vegas. First, it uses up less electricity. Since fiberglass swimming pools have a smooth surface, there is less resistance in the water so the water can quickly move and circulate around the pool, even if you do not run the pump as long or as often. Next, these pools are also easier to clean. Since the entire surface is smooth, there’s nowhere for dirt to settle. 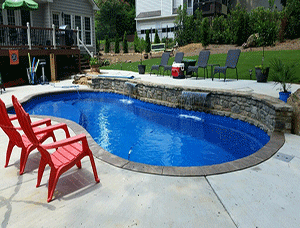 Finally, fiberglass swimming pools also use about 70% less chemicals per month than other types of pools. The algae that grows on the pool can simply be wiped away, plus, since fiberglass is a stable material, you don’t have to worry about chemical reactions. 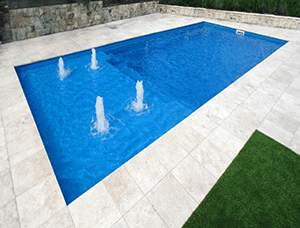 Just like anything, there are some disadvantages of fiberglass swimming pools. First, although these pools come in a range of sizes and shapes, you are still limited to what’s currently available on the market. You can’t customize the shape and size of these types of pools. Also, there may be certain restrictions on what kind of pool you can have depending on your landscape. If your yard cannot accommodate the type and shape of pool you want, then you may have to settle for a smaller pool or another shape.